Good question. I never say no to alcohol with my clients diets as it’s not realistic. Often, the all or nothing mindset sets people up for failure, because once they have one beer, they decide, “Oh well, I’ve already screwed up so I may as well have 10.” Which combined with the ‘drunken munchies’, means game over. Beer, shots, margaritas; they can all be ok. Following a few rules could save you. Consuming more calories than we need makes us fat. Under normal circumstances, it’s the fat that we eat that is stored. The fat in the foods we eat will only be stored when we consume over our energy needs for the day. It’s tough for the body to convert excess protein intake to fat, and only with regular overfeeding does the body convert excess carbohydrate intake into fat. However, they both contribute to the energy balance for the day, so indirectly they cause fat gain my causing us to store the fat we consume. Alcohol does not have any fat, but it has an energy value. Many popular alcoholic drinks usually contain carbs (either from fruit as with wine, hops/wheat/barley as with beer, or sugar from carbonated drink mixers). Alcohol calories take priority as fuel in the body over other fuel sources (like your love handles). This is because the by-product of alcohol metabolism, acetate, is toxic. So when you drink, fat burning stops until you burn those calories off. Drinking can easily push us over our calorie budget for the day. This causes some, or all of the dietary fat we ate on this day to be stored as bodyfat, depending on how much over your maintenance calories you drank. 1 g of alcohol contains 7 kcal. 1 g of fat contains 9 kcal. Q1: Your food intake for the day is 1000 kcal under your calorie needs for the day, 50 g of your calorie intake was from fat. You have three drinks, totalling 500 kcal. Do you gain or lose fat on this day? A: You are still in a 500 calorie deficit, so you lose fat. Around 55g of it (500/9). Q2: Your food intake for the day is exactly at maintenance calorie needs. You have eaten 100 g of fat on this day. You then consume drinks totalling 500 kcal. Do you gain or lose fat on this day? A: You are over calorie needs by 500 kcal. You store around 55 g of the 100 g of fat you have consumed on this day (500/9), the rest is burned. Q3: Your food intake for the day puts you in a 500 kcal deficit. However, you then go out binge drinking with the boys and consume 2000 kcal worth of drinks. Do you gain or lose fat on this day? A: Your net calorie intake puts you in a 1500 kcal surplus. All fat consumed on this day up to a value of 1500 kcal (~166 g), will be stored. If you kept fat intake low on this day, only that amount of fat will be stored. All good? Don’t worry if not just yet, let’s have a look at how we put this into practice. Moderation, though hard to define, we’ll call when you drink 1-3 drinks. The key in these situations is to reduce your food intake by an amount matching the calorie content of the alcohol you are drinking. You can look that up here. The best way to do this is to reduce your fat and carb intake, as you need the protein for satiety and the muscle sparing properties. Remember, 1 g of carbs and protein contain ~4 kcal, 1 g of fat contains 9 kcal. If the calorie total for those three beers (that’ll be carbs and alcohol) comes to 600 kcal, consider taking out 75 g of carbs (300 kcal) and ~33g of fat (~297 kcal). What are the downsides of doing this often? Alcohol gives us energy, but with none of the benefits associated with the other macros. When you are dieting, recovery can become an issue. When using alcohol calories (instead of say, carbs) to make up your calorie budget you’re stealing from the band-aid drawer so to speak. This is why when you’re dieting you should aim to drink as infrequently as possible. When you are bulking, you’ll gain more fat that you otherwise would have. Note: I’m not suggesting anyone ‘drink’ their calories on a regular basis. I’m just saying, you don’t have to let worries about your diet spoil your social life, if alcohol is a part of it, if it’s just occasional. Counting calories isn’t very fun when you’re in the middle of a party. If you’re drinking a lot, you’ll quickly find yourself over your calorie allowance for the day easily. Fortunately, we can take advantage of the fact that the body has trouble storing anything but dietary fat in the short term when we go over our calorie balance for the day. Eat your protein target for the day to preserve muscle mass (lean sources such a chicken, egg whites, casein protein), restrict carbs to veggies. Try to drink shots, dry red wines (they are lower carb), or spirits with zero-calorie mixers (I like Coke Zero and whisky). If you follow those few rules and keep these things infrequent, you won’t ruin your progress. Yup, an increase in caloric expenditure and a decrease in intake will achieve that. Thank you, that was very informative and well written article! I think I will visit your blog/page more often! I have a question about the advice to keep fat intake very low on days when drinking a lot. I’ve seen this in other places as well (e.g. Menno Henselman and Martin Berkhan) but I’ve never seen an explanation of why this is so. Given that your total energy balance determines your weight gain/loss, how is this affected by the fat/carb ratio in the presence of large amounts of alcohol? For example if I consume 2500 total calories on a heavy drinking day of which 100g is pure alcohol (700 kcals) and 180g is protein (720 kcals), that leaves me 1,080 to consume as carbs and/or fat. If my TDEE is normally 2,000 kcals, surely there is an excess 500 kcals that must be stored somewhere regardless of how much fat I take in? However, the claim is that we can avoid fat loss by making the 1,080 kcals almost all from carbs…so what happens to the excess 500 kcals in this case? Are you saying it gets excreted…or does your energy expenditure ramp up instead (maybe thermal effect or something) to burn it off even though you’re not doing any extra exercise? (For non-surplus scenarios (either maintenance or deficit), it’s also not clear why the fat/carb ratio would matter). My understanding is that excess carbs are burned off as heat through dietary thermogenesis rather than fat because storing them as fat costs the body more than it is worth. In some cases, such as slamming mad high fructose corn syrup, the body does convert the carbs to fat because it’s the only way it can handle it (de novo lipogenesis, as mentioned below). Fat is easily stored as fat. Carbs have the reputation then, for being fattening for two reasons: 1. When combined with fat, they contribute to more efficient fat storage. and 2. ketogenic-based diets burn fat by eliminating carbs and forcing the body to use fat only rather than glucose and fat for fuel. Outside of intoxication, the body is always burning a concentration of stored fat and glucose. So, if you are in a very low-fat, high-carb diet, you would burn your fat and vice-versa. This is just my understanding based on watching a million youtube videos, so take that with a grain of salt! Based on all that I’ve seen/read, I actually think a high carb/low fat diet is healthier and easier for me to maintain, and I’ve had better results with it. My downfall is alcohol, which is why I am on reading this article, lol! I think this article is quite good, by the way. Sure, it has to do with the metabolic pathways the body handles carbs and fats. Carbohydrate is only converted to fat with a chronic surplus, which you don’t have when dieting. So in the case of one-off drinking days, you get away with it. Fat, on the other hand, does not have to go through any complicated pathway to be stored as fat. Is this interests you, google ‘de novo lipogenesis’. Thanks for the reply. (Realised after I sent the question that you had already covered this scenario in question 3 in the quiz section so apologies for repeating it). It’s a quick shortcut to be used on occasion. If you try to use it often your body will outsmart you by turning the carbs into fats via the process of de novo lipogenesis. Thanks, that makes sense. I guess the corollary is that in the following day or days, you will have to reduce your net calorie intake by the same amount as the surplus on the drinking day. Otherwise, the energy stored as glycogen on the drinking day will be burned off preferentially, resulting in more of your fat intake on those following days being deposited as body fat. (If you try to prevent this by keeping fat super low without a drop in total calories, I’m thinking eventually the de Novo lipogenesis will ramp up to convert the stored carbs to fat). So in other words, it seems the body fat that you gain or lose over a multi-day period that includes the binge drinking day will depend entirely on your net energy expenditure over all of those days, and the particular fat intake on the binge drinking day is thus irrelevant. Basically, we are on the same page. The assumption made behind my logic was that the person is dieting (in a caloric deficit). Under those circumstances, they will be at least partially glycogen depleted, and those glycogen stores can mop up excess carb intake on one day where a lot of alcohol is consumed along with carbs (enough to push someone over caloric maintenance), and only the fat eaten will be stored (hence the logic to keep it low). Yes, the energy in the glycogen stores will be burned off at some point, but not preferentially. (Glycogen in muscles can only be used locally by that muscle, unlike fat in the bloodstream which is used all over). So, the diet will not be delayed by doing this. Over the longer-term, I suspect that it will all work out on net. This is a strategy more for those that are already lean (have definition and want to maintain it) while drinking occasionally. But then; I’ve only been to Brit pubs for lunch. Could you do something on how much alcohol inhibits muscle building? How much do we reduce our muscle building by drinking? Reduce by 50%? 25%? 15%? If it’s 50% I’m done….15%.. well; let ‘er rip yeah? I don’t have a figure, but it’s not 50%. I don’t have a question, I just really wanted to thank you for this article! I’m doing an “Eight Week Challenge” at my gym with a trainer with no nutrition qualifications whatsoever making weird recommendations and just talking nonsense, like the “your liver won’t burn any fat and won’t be able to do anything if you have any toxins” while drinking a monster energy drink and vaping….. Thank you for being a voice of science and reason!! Hi, I have been told that you cannot burn fat for up to 3 days after drinking alcohol. Is this correct? Complete nonsense. The alcohol calories are preferentially burned, that’s all. 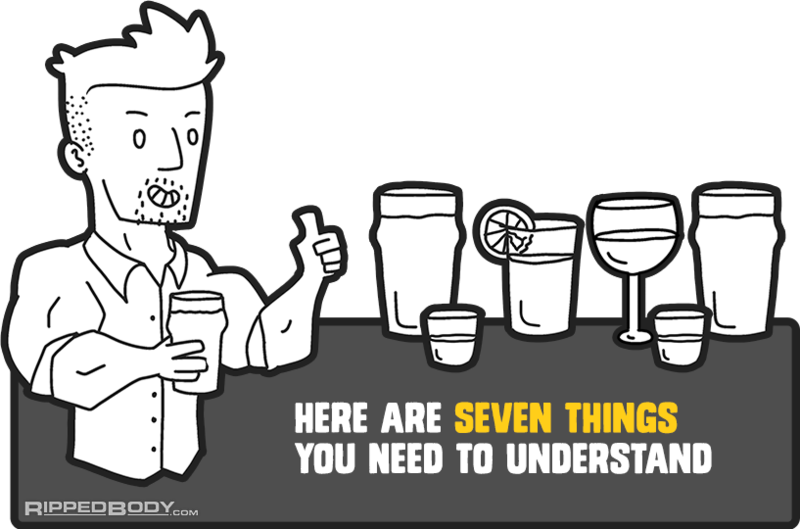 See the “7 Things to understand” section. I saw one man taking alcohol every day so I ask him why,he told me that someone advise him to be taking it everyday that it will help him to lost fat content of his body. Is the man right? I have a wedding coming up, i am currently dieting with an allowed calorie intake of 1500kcal. Do i understand correctly that if i will drink i.e (6 wiskeys) 600 kcal, i should limit the food i take that day to 900kcal? Then in the end of the day my body will see the same amount of calories (although not the same nutrition) but at least will mitigate the drinking of that day? Very informative, I’d love to drink diet coke in my drink but unfortunately everytime I have tried, the next morning I get a sugar hypo and it’s not a good feeling, feel out of it. Only with original coke this does not happen, been tested for diabetes and I was fine. It’s crap because it’s hampering my cut and hampering my social life. I think you may be confusing correlation and causation. I have tried every diet and I seem to be failing. I don’t gain and I don’t lose. I am 47 about to be 48, 238 lbs at 5′ 10″. I have been dieting for at least a year with no success. It also makes it hard when my wife and kids just eat anything although I do stick to my plan fairly good. I eat 2000 calories a day give or take 100 calories. At this point I am eating very low carbs and I stop eating by 8pm and wont eat until noon (IF). I drink on weekends Vodka and soda. Is cutting carbs bad or what. There is so much controversial info about carbs and fasting. Who is right and what should I follow considering everyone says they are professionals and their way is the right way. Bob, thank you for the comment. Read this. Trust me. You’ll be lost forever until you do. It will put everything into perspective. Even just the first chapter will clear things up, a 5 minute read. I just finished reading your eBook (complete guide to setting up your diet) and that was the most lucid, well-written discussion on how to establish diet parameters that I have seen yet, and I have read extensively on this subject. I’d really like a no-judgement answer to this question, I realize It’s alarming. I am in the military and I’m looking to cut down. I regularly fill a glass with just straight vodka and chug it. Probably a red solo cup almost filled up. I do this twice in a night, probably two or three times a week. Am I completely destroying my progress? Yes, but also more generally, your health. Specifically, you are damaging your liver and past a certain point it can become irreversible. Tell your CO, he will get you the counseling you need. Hi I’m currently on a diet and walking every night and so far I’ve lost 23 lbs. Every Saturday me and my wife have friends over and we drink and have a good time and I’m not looking to change that but I would like to know I’m not ruining my progress for the week by doing so. I don’t eat much and only healthy food before I drink and I drink only whiskey on the rocks is that ok? Or can that hurt what I’ve done for the week? Just read the article. Interesting approach. I tend to disagree with the statement that only all the excessively consumed fat is stored when drinking alcohol. First of all why would the fat be stored at all if the is no insulin in the blood which is storing hormone (assuming no carbs was consumed) ? Secondly if somehow there is insulin released to the bloodstream anything that we consume (above daily caloric needs) will be stored as fat not only fats, so will carbs and proteins. Right ? Hi Bart, thank you for the questions. 1. Insulin is not needed for fat to be stored. I think you may have read some incorrect information regarding insulin. It comes from the insulin hypothesis of obesity that Gary Taubes and Robert Lustig make their money off of promoting (the former, despite his own research results contradicting his hypothesis). It is an overly-simplistic form of scaremongering that is just about simple enough to gain popularity. So happy to find this information. You are right to say that immediately after drinking when dieting one can feel defeated. This information gives me a better understanding of what happens to dieting when drinking and the choices we can make to fit into our lives. I feel less defeated this morning. Thanks! Hi Andy. Really great article!! I would have one question. Very important to me. I’m regularly invited to dinner to my friends. It happens regularly once in 2-3 weeks. We drink no alcohol but eat dinner and than I can’t count calories. Which pieces of advices would you give me. What schould I pay attention to? Eat more protein for instance? Should I resign from dinner und take my calculated eating ? I will read it. It’s so common problem, that I’m sure it is described there. By the way I will my knowledge extend. Love your site and have made great progress with the information you’ve provided! If I knew I had a night of drinking coming up and I solely ate grilled chicken breast/veggies/salad as my meals for the day (which would be very minimal fat). Would the type of drink I have become irrelevant since I’ll be storing minimal fat once I go over maintenance calories? I.e. would there be a difference between me having Michelob Ultra vs Sam Adams Summer Ale, which is more calorie dense? If I understand everything you’ve wrote correctly, the answer would be “no”, but just figured I’d check. However, I’m a little confused. On https://rippedbody.com/how-to-use-intermittent-fasting-to-eat-like-a-king-and-keep-your-abs-this-holiday-season/comment-page-1/ you claim that the weekly intake is more important and you can even out during the following days to avoid fat gain. They are both true. The one looks at what happens on a single day, the other looks over the course of a week. I have a question im pretty new to all this and was wondering if you can help me? How much alcohol would i be able to drink afterwards? How much alcohol would I be able to drink afterward?